Perhaps one of the most daunting tasks of the daily routine on the farm is cleaning the barn. Every morning I arrive at the barn and have fourteen hungry mouths to feed, then one by one lead my friends out to pasture. Only once everyone is set free to graze am I able to tackle this chore. It is an extremely time consuming and labor-intensive process, but one of the most rewarding of my day. Thinking back to my first day at Soulful Prairies I recall Linda having me work side by side with her and her family to see if it was something I was truly interested in. It was a trial run of sorts to see if everything and everyone would mesh well. I remember thinking how awesome it was to be out in the open air and how much I hoped the trial run would be a success. When the daily cleaning was done there was a sense of pride that came over me. I thought to myself, “I helped do this, I worked hard and made something truly beautiful.” Luckily for me, Linda saw the pride I took in this task and liked me enough to give me an opportunity to work at the farm. Having started at the beginning of June I have gone through that routine roughly 125 times now and have gotten quite good at it. Once I got the rhythm down it became second nature to me and I barely have to think about what I am doing. This allows me a good four to five hours every morning to think about anything and everything. I use it as a sort of working meditation. Some days it goes quickly and other days it feels endless. Regardless the end goal is always the same, make it beautiful for all to see. In anticipation of writing this, I focused my morning thoughts on what exactly I love about this “chore” and have realized it is the process of transformation. When I start, the stalls are all varying levels of disaster. When I am finished they are clean, fresh, and ready to start the process over. I believe my affinity for this task is due to the similarities it has with changing our lives. No matter how crazy it gets, with the right level of commitment, it can be brought back to order. The process of cleaning the barn requires that certain steps be done before others, it just makes sense. For example, I wouldn’t sweep the center aisle first because I would just track everything from the stalls into that area while cleaning. Similarly, you cannot calm the chaos in your life until you calm your mind. Clean out your stalls first (your mind) then sweep your aisle (your life). This is important because our mind controls our actions and without our mind, we cannot take action. Just as I have a variety of tools to clean the barn, we have a variety of tools we can use to clean our minds also. Some people find value in their spiritual beliefs, meditation, yoga, breathing techniques, sweat lodges or even just the sound of silence to help calm their minds. I personally find it is important to use all of the tools we have available to us to get the most out of life. I could probably use a simple shovel to clean the barn, but the results would not be nearly as favorable as if I used all of the tools available. In the last two years, I have transformed my life in extremely dramatic ways. Much like cleaning the barn, it has been a time consuming and labor-intensive process. I had tried to do this in the past but failed time and time again. It was only in this last attempt that I realized I had been trying to “sweep the aisle” before “cleaning the stalls”. 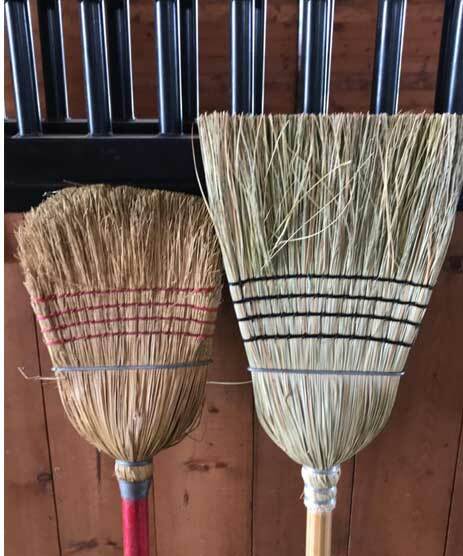 Once I figured out the correct order to clean my own barn I saw fantastic results! Through finding my own spiritual path, practicing meditation and breathing techniques, and squeezing in yoga when I have the time I have created a life that I love to live. We all have the choice in life to live in a loving way and be proud to share our life with the world or let our barns be a disaster. Personally, I choose to keep the barn clean both in my mind and at Soulful Prairies. It takes a great deal of commitment to maintaining the beauty that people appreciate when they visit the farm, and far more to maintain the beauty of our minds. The transformation makes all the hard work worthwhile.